The Kurds, a great people, a Muslim people, the sons of Jaabaan Al-Kurdi the SAHABI (unknown to most in the Ummah) of the Messenger of Allah (sallAllahu ‘alayhi wa Aalihi wa sallam) who brought Islam to Kurdistan. The Kurds, the sons of Salah Al-Din Al-Ayyubi, the hero of every ‘Arab and ‘Ajam (non-Arab) in this Ummah, the just warrior who was very well aware of the danger of the Rafidi Shia cancer, thus before liberating Jerusalem from the barbarian Cursaders he first dealt with the Shia Rafidah by wiping away their Baatini Ismaa’ili Ubaydiyyah (Alleged Fatimid) state that the TWELVER Shia Rafidah ironically take pride in to this very day (and on top of it wrongly claim that back then Egyptians used to be Rafidi Shi’ites although Egyptians themselves never used to be Rafidi Shi’ites they were merely RULED by a Shia clan – not even a Twelver one – just as Sunni Syria is ruled by a polytheist Alawite clan). 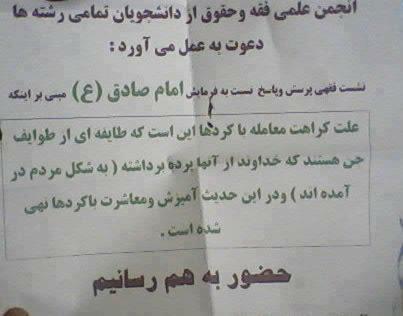 To this very day most Kurds ascribe themselves to the Ahl Al-Sunnah, even in Iran the absolute majority of the Kurds do so (a minority of them are Shi’ites) and in fact they make up the majority of the Sunnis in Iran numbering between 7-10 million (these are old official numbers, the Iranian regime just like any other oppressive regime triest it best to keep the number of its minorities, particlularly the Sunnis as low as possible in any statistic). 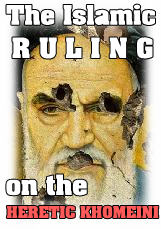 Their struggle against the Safavid Khomeinian Rafidi regime is unfortunately absolutely unknown to most of the Islamic Ummah (let alone their struggle against the ancient Safavids a five hundreds years ago who ironically were of Kurdish descent and moved to North Iran and turned Persia by force from a majority Sunni into a majority Shia country, most Kurds opposed them though) and even completely ignored by most so called Iranian (mostly nationalist) human rights groups in the west who blinded by their chauvinism barely mention anything about the ethnic minorities inside Iran (i.e. non-Persians) to begin with, heck even the struggle of ethnic Persian Sunnis (most of them based in Larestan i.e. southern parts of the Fars province, Hormozgan and Khorasan province) are barely covered and mentioned by Persian ‘human rights groups’ in the west, although the Iranian Sunnis in those mentioned areas are all ethnic Persians, so what can we expect from chauvinists, be it the nationalist Iranian groups or the Rafidi regime (who both suppress non-Persian ethnic groups either due to ethnical or religious reasons) in regards to Iranian Kurds who don’t just differ with most Persians religion wise, but also in regards to language and ethnicity. The struggle and sacrifice of the Kurds in general and in this case the Iranian Kurds is unbelievable, to many to be mentioned here, starting with the crimes of Khomeini the Kafir Mushrik enemy of Allah and Islam who gave the Kurds empty promises just before the Revolution in order to fool the masses and gain support for his Revolution against the Shah only to backstab the Kurds once he came to power by imprisoning the biggest Kurdish Sunni leaders such as Ahmad Muftizadeh (who opposed Khomeini after witnessing the mass-executions and lies of Khomeini. Moftizadeh famous statement was addressed to Khomeini himself, saying that you (Khomeini) promised an Islamic Revolution but in fact brought a bloodthirsty secterian Safavid Revolution) and even attacking Sunni towns of the Kurds who ‘dared’ to protest against the insults and humiliations of the then newly installed Rafidi Shia regime towards the Sunnis and the Kurds (we certainly don’t support every uprising of ANY Iranian Sunni group, particularly not the separatist ones and communist ones, which definately existed amongst Iranian Kurds, nevertheless in all fariness, nobody can disagree that most of the Kurds were simple felt betrayed by Khomeini and his regime). In 1993 a newly constructed Sunni mosque in Sanandaj city was destroyed by a mob of Shi’a zealots. Despite the fact that more than one million Sunnis live in Tehran, many of them Kurds, no Sunni mosque exists to serve their religious needs. In a rare public protest, eighteen Sunni parliamentarians wrote to the authorities in July 2003 to criticise the treatment of the Sunni Muslim community and the refusal to allow construction of a mosque in Tehran that would serve that community. A number of Iranian Kurdish scholars openly spoke against the heretic Khomeini and even wrote books exposing his heretical beliefs, scholars such as Naser Sobhani who wrote a whole book in refutation of Khomeini’s (and the Rafidah’s in general) allegations against the Mother of the Believers Aisha (may Allah be pleased with her). Mulla Mohammad Rabi’ie who on December 2, 1996 was assassinated by the Iranian regime in the city of Kermanshah is another victim of the regime and its long history of assassinating influential Sunni figures inside Iran. His assassination led to violent clashes between Sunni Kurds and the security forces. Mulla Rabiei was the prayer leader in the Al-Shafe’i mosque in Kermanshah. The protests continued for three days and spread to neighboring towns in the region. As of May 2010, there were at least 16 other Kurdish political prisoners on death row. Not one case has been reported as having received a fair trial, we have reported about them in the FOLLOWING ARTICLE. All of these brave man are nearly completely unknown to the Islamic Ummah but In sha Allah we will try our best to translate as much of their speeches and articles as we can, although we can’t promise anything (but we are happy if anyone who knows Farsi is ready to translate some material we can provide him/her with). As you can see, the Kurds have suffered a long history of discrimination in Iran, sometimes based on their ethnicity alone, sometimes based on their religious beliefs and currently (in Rafidi Shia Iran) even based on both. As for the religious part then there is more to it than Kurds just being a non-Shia nation in a majority post-Safavid Shia Iran. The deep grudge and hatred the Shia clergy and Shi’ism itself as a sect have towards Kurds is ancient, shocking and unknown to many Muslims. What is actually mind-boggling (especially after reading this article) is that there are still a minority of Shi’ites amongst the Kurds (in Iran and even Iraq), but after all many slaves have accepted the corrupt religion of their masters (like most Black Africans who were shipped to America and turned into worshippers of a half-naked white man on the cross). The matter of fact is that Shi’ism has a very negative view towards Kurds, most probably due to Kurds being always a majority Sunni people and having brought up man throughout history who gave some massive blows to Rafidi Shi’ism (Salah Al-Din the Kurd who wiped away the Fatimid heretics or Shaykh Al-Islam or Shaykh Al-Islam Ibn Taymiyyah – who most likely was a Kurd, since being born in a Kurdish area AND not being ascribed to any Arab tribe). Whatever the reason, the fact is that Kurds are not being positively mentioned in Shia sources at all, in fact they are described as demon like creatures who merely look humand and with whom one shouldn’t interact at all. Let us provide you with some sources along with Shia justifications which are all nothing but cheap attempts to hide another ugly fact of their even more ugly religion. The same and similar narrations can be found in three of the most important books of Hadith of the Shia. The compilers of the the Four Books (the Twelver Shiʿa term referring to their four best known hadith collections) have put even separate FIQHI chapters in their books i.e. using the above narrations as EVIDENCE (despite their weakness in their chains). Among them are: Al-Kulayni in his Al-Kafi, Al-Qummi (Ibn Babawayh) also known as ‘Al-Sadooq’ (in fact the Kadhoob) in his ‘Man lā yahduruhu al-Faqīh’ and ‘Al-‘Ilal Al-Shara’i’ and Al-Tusi (Shaykh Al-Ta’ifa, the Chief of the Shia Madhab) in his ‘Tahdhib al-Ahkam’. All these books refer filled with chapters in regards to established Fiqhi issues, so even IF the aforementioned AHadith might have problems in their chains of narrations, they were still good enough according to the big guns of Shi’ism to be used in Fiqh i.e. they have derived rulings from them. First let us provide you with some standard phrases you will be confronted with when cornering the Shia with the narrations mentioned above (taken from Shiachat.com). Its not racism, the Imam was just pointing out the people to avoid in marriage and business etc, due to their general attributes at the time. Those attributes no longer apply, so the hukm no longer applies. 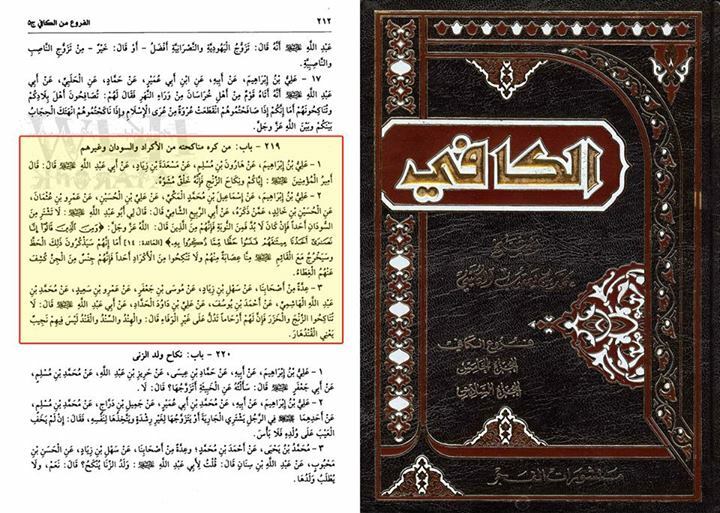 Al Kafi is a book which contains a collection of hadiths. Some of these hadiths are true and some aren’t. Even IF all the narrations above are weak in terms of their chains of transmission, the mere fact that Shia scholars have used these narrations Fiqhi wise (i.e. in jurisprudence) is proof enough that these are established beliefs, deeply rooted in Shi’ism and propagated by their classical scholars. The Kurds, according to the aforementioned narrations are demons which we are able to see, no lame excuse will work for any sane and intelligent person who actually has pondered over these fairy-tale narrations. Kurds according to Shi’ism are of a different nature than the rest of mankind and based on that one shouldn’t even interact with them, let alone marry them. Al-Majlisi (in his Mir’at Al-Uqul) comments on the Hadith (“but never marry anyone of the Kurdish (people) for they are part of the Jinn (demons) whom the screen was lifted from them”): و يدل على كراهة معاملة الأكراد، و ربما يأول كونهم من الجن بأنهم لسوء أخلاقهم و كثرة حيلهم أشباه الجن، فكأنهم منهم كشف عنهم الغطاء. مرآة العقول في شرح أخبار آل الرسول، المجلسي، ج 19 ص 145He basically says that the Hadith proves that it is disliked to interact with the Kurds. He says that Kurds being of Jinni (demonic) origin could refer to the Kurds being similar as demons in regards of having bad manners and being treacherous! و الحي البطن و القبيلة، و ربما يأول كونهم من الجن، بأنهم لسوء أخلاقهم و كثرة حيلهم أشباه الجن، فكأنهم صنف منهم كشف عنهم الغطاء، و لا يبعد حمله على الحقيقة. He says it is not far-fetched to take the Ahadith about the Kurds according to their apparent meaning since there were indeed groups that were of demonic origin, just their apparence was human! NOTE: Keep in mind that the dilemma is not just that Shi’ism text and their biggest scholars in history argued that Kurds are of demonic (Jinni) origin, for one could argue that there are good and bad Jinn (although that excuse would also not work since as it can clearly be seen in the words of the Shia scholars, it is all about EVIL demons with BAD Akhlaq/manners etc. i.e. demons/Jinns in a negative sense), but that’s not the main point, the main point is that the ‘infallible’ Imam has mentioned that based on the demonic nature of the Kurds one shouldn’t even interact with them (let alone marry them!). Another giant of Shi’ism who quites Al-Majlisi without criticising him nor rejecting the narrations! كتاب المتاجر .. (باب آداب التجارة)وينبغي أن يتجنب مخالطة السفلة من الناس والادنين منهم، ولا يعامل إلا من نشأ في خير، ويجتنب معاملة ذوي العاهات والمحارفين.ولا ينبغي أن يخالط أحدا من الاكراد، ويتجنب مبايعتهم ومشاراتهم ومناكحتهم. So he’s telling people not to marry them or buy from them or sell them in the absolute sense with no exceptions. He put a whole FIQHI chapter calling it ‘The Etiquettes of Business’! He states (without making ANY exception at ALL) that it is dislike to interact with Kurds, be it business-wise, marriage wise etc. “دليل كراهة معاملتهم مطلقا عدم خلوص من يعاملهم من أذى بسببهم لعدم الخيرية فيهم غالبا”. Al-Majlisi (in his Mur’at Al-Uqul) says “SAHIH” 24/57. He basically says that maybe Imam Al-‘Askari meant with ‘the Kurds’ the thieves among them, since most Kurds are thieves! Who gave this heretic the permission to judge over the majority of a people and call them thieves?! But putting that aside, Al-Majlisi’s explenation is flawed for by him claiming that the Imam merely meant the ‘thieves’ among the Kurds when he said that there is no dealing with the Kurds except with the sword, then how could that be? Since when is the thief being executed according to the Shari’ah of Islam? Even the Rafidah have no such a thing that the thief will be executed! So the lie they have ascribed to the Ahl Al-Bayt along with the explenation of Al-Majlisi makes the Ahl Al-Bayt (Imam Al-‘Askari) look like utter ignorants who seem to be as bloodthirsty as the Safavids were. 3. What about similar narrations in Sunni books? This is a flawed comparison, although it is true that similarnarrations can be found in Sunni books, yet they are not reliable to ANY (let alone major) Sunnah scholar (in contrast to the top Shia clergy), NOT merely due to the fact of the weakness in the chains, but rather due to the fact that Sunni scholars NEVER acted upon these narrations, let alone filling chapters with Fiqhi rules of how to deal with ‘inferior’ ethnic groups. Yes, based on social realities some of the Salaf had view that for example a Hashimite woman shouldn’t marry ANY non-Hashimite man, not even Arab one, or that an Arab lady shouldn’t marry a non-Arab. These rulings were based on social realities of those times, where for instance the society was not ready to see marriages between Arabs and non-Arabs etc. No Muslim scholars ever claimed that this is in a general sense, let alone describing (for instance) Persians as being of demonic origin with whom one shouldn’t interact and if possible one should kill them (in fact Persians are praised in Sunni literature and Hadith). On the other hand the Shia position is the position of the ‘infallible’ (source of the religion!) from whom the Shia scholars have extracted their views from and hence wrote what they wrote in regards to different ethnic groups such as the Kurds. So there is no comparison at all, for the Shia scholars have ACTED upon their narrations that condemn certain ethnic groups and even IF they (their contemporary scholars) have changed their attitudes towards some negatively portrayed ethnic group, yet when it comes to the Kurds there is no way they can change their attitude (and actually never did), since Kurds have not been warned against in a general sense in their books, rather Kurds of have been described as being of demonic origin, and that one should not interact with them and that if possible it’s best to kill them. Well, the chain of the narration is weak and interestingly there is a SHIA in the chain (أبي ولاد) and the rest of the narrators are weak and rejected according to the biggest Sunni Rijal experts such as Abu Hatim. But as we pointed out, it is not just about the chain of narrations, we have to play fair-game, if Sunni scholars would have acted upon these narrations and fill whole Fiqhi chapters with these kind of narrations and therefore stating their soundness (regardless of the weakness of the chain of narration) then we ought to admit that the Kurds are also potrayed as evil in the books of the Ahl Al-Sunnah, but alhamdulillah, the bitter truth is that this is not the case, this is only the case in the religion of Rafidi Shi’ism where their top scholars have approved these kind of narrations, regardless of the weakness of the chain of narration. Comment: Call the above a fake or whatever you like, it was and is the belief of the Rafidah, especially those in authority, in the past and to this very day and their actions against the Kurds speak louder than empty excuses.